Check out recaps of other episodes by clicking on the Project Runway tab. I have been hugely disappointed that the only viewing of this show in Canada is on a paid station. I have followed every season of Project Runway in the United States and both seasons it appeared in Canada. After complaining profusely about this, I was fortunate to have fellow writer Josh Langston of The Social Life guide me to a link. Although very slow to upload, I am finally getting to see the episodes. Thanks Josh! 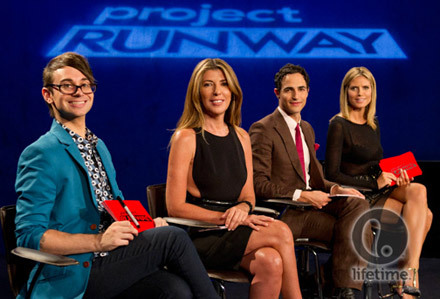 To bring a note of surprise to Project Runway Season 11, it was announced in episode 1 that they would be working in 2 teams. I can't imagine anything being more disappointing to the designers. They are there to show what they can do, but instead have to try and connect with a team they may have nothing in common with artistically. The pasted on smiles were something to behold according to reviews and one designer said what they were all thinking, "Hell no. This can't be happening." On the other hand, very few designers start out with their own label, they work in a collaborative environment to produce someone else's brand. And in the long run, only a small handful from that grouping manage to go on to offer their own private label. So perhaps this twist has something to recommend it. Tim certainly approves. "One of the things I am most excited about in season 11 is that you are working in teams. I love the whole concept. Remember, it's your design, but part of this challenge is to get to know your teammates and take advantage of their feedback and support." He also reminded them to remember, "You're only as strong as your weakest link." Other changes this season include the replacement of Michael Kors with well-known designer Zac Posen. Returning are regulars Heidi Klum, Nina Garcia and Tim Gunn and the show will continue the practice of having a guest judge each week. Because of the new format, Tim's critiques are now done in a group session which could create some serious drama if there is dissension amongst the team members. The runway includes both the individual look as well as a second group presentation for the judges. The challenge this episode? Create a garment that shows your personality inspired by a view of New York City, built with input from the rest of your team. Thankfully they didn't require a cohesive collection in this first collection - just that they use their team to help hone their design. The team was given $150 per designer - $1200 - but could chose to divide the money unequally if they wanted to. As always, the designers have to deal with time management which will limit their design work. Keeping It Real showed more interaction between the designers with those having better construction skills giving advice. Dream Team the designers chose to work mostly alone. Team Keeping It Real - Stanley Hudson (45), Kate Pankoke (23), Richard Hallmarq (39),Patricia Michaels (46), Amanda Valentine (31), Layana Aguilar (28), Joseph Aaron Segal (30) and Daniel Esquivel (48) - took the the Hudson River on a boat for their inspiration. Their team won the challenge, so the top 3 were selected from their designs. Chosen were the looks from Daniel, Richard and Patricia with Daniel taking the win overall. It's very hard to evaluate Daniel's design on line because the black palette hides the peplum detail, but it is very well done. I loved the fact that Patricia painted her own fabric reminiscent of the windows in the skyscrapers, it really elevated the design in my eyes. What you can't see here is that all those printed pieces are individually applied on top of a cobalt blue under dress. It looks simple, but was incredibly complicated to construct. Here are 3 comments offered on the show's blog. Daniel - A striking silk wool crepe suit, and probably the most NYC-feeling garment of the episode. I particularly loved the cut of the pant. The judges gave this look the crown and I totally agree that it was an exciting standout for the season's first runway show. Richard - Zac Posen liked the use of asymmetry, and all the judges commented on the sporty elegance of the dress. Patricia - I was nervous when Patricia first started to work on her fabric, but the end result, with the incorporation of the cobalt blue detailing and cut-outs, was very strong and totally wearable. She's the designer I most excited to follow as the season goes on. Below are the other 5 designs from this team. I don't care for the shiny fabric Stanley used to create his jumpsuit as it's very hard for most women to wear and the is crotch is truly awful in the front - back view is fine. Although the judges weren't that taken, I actually like the casual look offered by Kate and would wear it - asymmetrical blue top and slim pants. Joseph Aaron's I keep looking at. I think there is a great idea here, but it just doesn't work the way he developed it. If the concept was fine-tuned, it has the potential to be really interesting. Dream Team - Benjamin Mach (35), Cindy Marlatt (59), Emily Pollard (24), James Martinez (29), Matthew Arthur (30), Michelle Lesniak Franklin (34), Samantha Black (28), Tu Suthiwat Nakchat (26) - explored the view of New York from the roof of the Atlas. As their team lost the challenge, the bottom 3 were chosen from their designs - James, Cindy and Emily - with Emily going home. Emily's was truly the worst of both teams and even she knew it when she looked at it on the runway. I would have included Stanley's jumpsuit in the bottom 3, so he is lucky to be saved by being in the top group. James - Yawn. Posen described it as "pedestrian," and that really sums it up: no one would protest this dress, and I've actually seen a number of people on my morning commute rocking the same basic ensemble, but there's nothing of substance or interest in it. Cindy - A ho-hum but acceptable silhouette that's totally ruined by a mind-blowingly bizarre combination of prints. Emily - Hot mess! Just a hot mess. A mishmash of silly pieces and poorly chosen fabrics, without even the benefit of smart construction to save it. I want to defend Emily (She's my age&3151;us eager early-twenty-somethings have to stick together), but she was way over her head here and got the boot because of it. When looking at the other offerings from the losing team, the shortfall in this concept is obvious. There are a couple looks here that could have been in the top 3 if their team had won. I think the designs by Matthew and Benjamin both stand out as exceptional and would have put picked Benjamin for top 3 if he'd been in the winning group. One possibility would be to take the top and bottom from each team and have them go head-to-head on the runway, but unfortunately that isn't the way the format has been set up. Hopefully they move to a solo format as the show progresses. I also think Tu's design is less flattering than James and could have been in the bottom 3 - but hard to say without seeing them in person. My favourite overall is Benjamin's, but I can't clearly see the interesting design detailing on Daniel's because the black colour hides it, so might feel differently if I could see them both in person. The judges commented many times on the difficulty of the construction, especially within a 1 day time limit. I also like the garments by Matthew, Amanda and Patricia. It's interesting to hear the judges comment favourably on some of the silhouettes I didn't care for. Just goes to show that we don't all love the same thing. If you want to see larger images of these designs so you can form your own opinion, you can go to episode 1's Rate The Runway.